Easter equals lamb, just like Christmas always used to equal turkey until everyone realised it was tasteless and quite difficult to cook it evenly without drying the whole thing out. Of course, lamb can dry out too but not if you cook it this way. Well, it might do if you left it too long but after four hours of tormeting yourself with the smell of garlicky, rosemary lamb then I’m pretty certain you won’t be able to wait much longer. We first cooked this in February 2008 and have cooked it several times since (five, according to the archives), always with the same brilliant result. It’s the most popular of any dish that’s appeared on Dinner Diary (generating 52 comments, fact fans) and every time we cook it, I marvel at how something with so few ingredients can taste so good. It’s popular with my mum too and since we were cooking lunch for her on Sunday, it was the obvious choice. The other great thing about this is that there isn’t any arguing over whether to cook it pink (our preference) or well-done (my mum’s preference) so it works well if you’re cooking for people with different tastes and don’t want to make more than one dish. We actually had this last Easter and cooked it with some butterbeans. The combination was good but the beans became quite oily so this year we cooked them separately which worked much better. They were very similar to these beans but with garlic and rosemary instead of mustard. 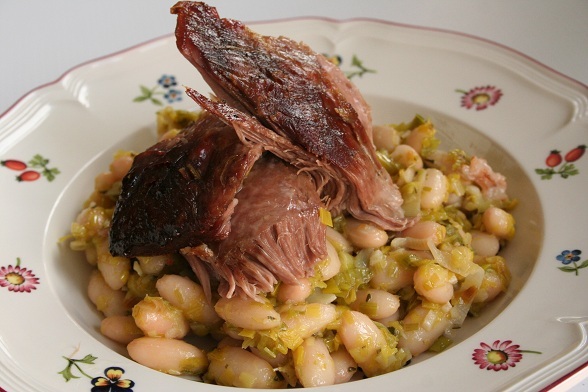 The best post to look at for the lamb recipe is this one. You could go directly to Jamie Oliver’s site since it’s actually his recipe but of course I would much rather you stayed here. Soften the leeks in a little butter and oil, before adding the garlic and rosemary and cooking for a few minutes. Add the beans, stir to combine and cook for five minutes. Season, add a good measure of oil and serve. *I usually use dried beans that have been cooked first but wanted to try tinned beans since last time the beans cooked somewhat unevenly. I did find that the tinned beans cooked more evenly but there was something about them that I didn’t like, a slightly plasticky taste perhaps.